It’s about time I got around to this one…my first Real Action Heroes figure, as well as my first bit of experience with the 1/6 scale line, Huke’s infamous Black Rock Shooter. I got this one at Anime Expo 2012, and actually had to pay a hefty price for her…in the form of my dignity. During my attempts to barter for a lower price on this figure, the excellent folks behind the stand said they’d lower it if I gave them the shirt off my back. I figured what the hell, it was worth it. What’s more, I’ve seen the same folks at Anime Expos these past few years again, and apparently they still have my shirt. It has been missed. 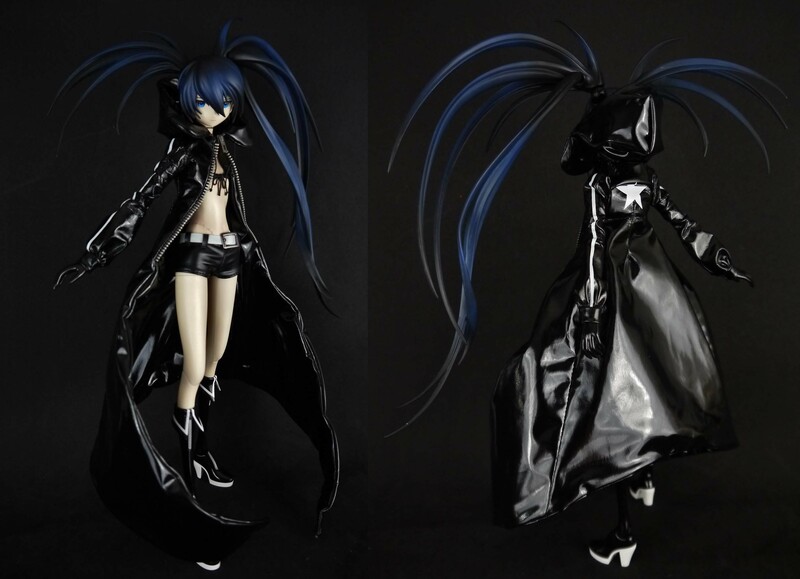 I’m pretty sure this is just about the highest quality articulated Black Rock Shooter figure out there. The Good Smile statues are in a whole different world of their own, but the Real Action Heroes are basically dolls. Showing her off first without her jacket on. I know, how lewd and perverted of me. When I first came home with this my mother actually exclaimed, “you went to Anime Expo to buy a half-naked girl?” I mean, she wasn’t wrong, but hey no shame. The only shame was that I myself had to get half naked to obtain said half naked girl. The joints at the elbows, shoulders, and knees are a bit of an eyesore, but thankfully the former two are covered when the jacket is on, and everything else is extraordinarily well hidden. Her torso is actually made of some soft synth-skin material – yeah, it’s actually fleshy. My mind was nothing short of blown by this; big props on Medicom’s part for going the extra mile for realism. The skynth skin means there are joints hidden inside the main body, including a highly articulated neck joint and a stomach/abdominal joint. I’ve heard some horror stories about the skin ripping and tearing on some figures, but thankfully I’ve never had any problems. It feels weird saying this about a half-naked female doll, but the shading on the flesh to give it different tones and accents is done extremely well. Parts like the collarbone area have distinctly different shades of flesh tone, not to mention the scars and stitches on the torso that are on-point. While it would’ve been nice if the legs also featured synth-skin to hide the knee joints, it’s not so noticeable after you get used to it. Certainly much better than the infamous Figma. Something to note: while this figure is nearly perfect in terms of quality control, there are just a few nubs here and there that were left undone…not the biggest deal in the world, but for something of this price I expected better. 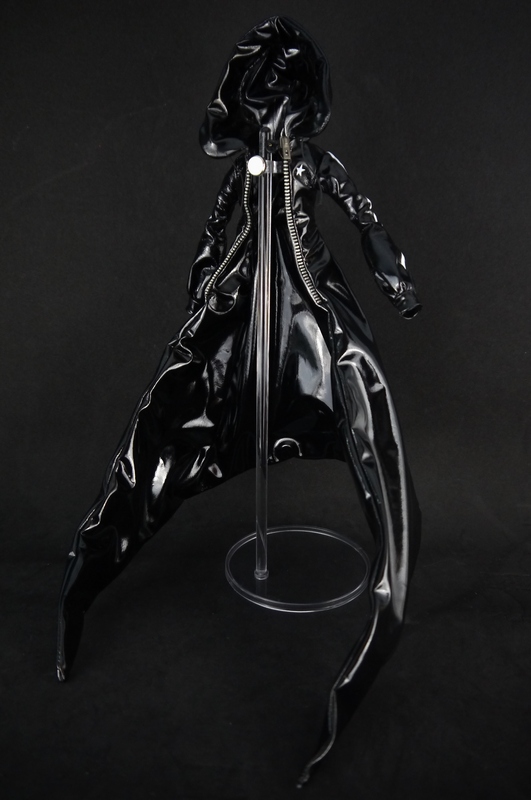 Black Rock Shooter’s main piece of wardrobe is a massive black jacket, faithfully replicated in figure form out of some slippery, glossy material. While the zipper can’t actually zip up, there is a little button at the very top to hold it together over her collarbone. The entire thing is just massive at the bottom; I can’t tell if this was staying true to the source material or blatant over-exaggeration. Sadly, the material wears out a bit if you bend it with the figure a lot. The most obvious areas would be the arms and shoulders. The material seems to be flaking, coming off almost. I should point out now that the hood can be put on, but I never bothered. The coat really completes the look. There’s also what feels to be a wire inside the jacket, stretching from end to end in the tails. This allows the coat end to be bent and “posed” however one desires. So…I’ll just come out and say it now. I done goof’d on the wrists a bit. One time when I was changing out the hands, the long peg that inserted into the arm from the hand broke off, I don’t even know how. I wasn’t wrenching the thing out, so I suppose it was just weak plastic. Either way, the fact that the peg broke at the root while it was all still inside the arm means that peg was lost inside the wrist forever. I had the choice of gluing in a hand permanently or just leaving BRS handicapped forever. Thankfully though, the wrist joints are actually so highly articulated that they sport two joints. The broken joint above is basically what the broken part looked like; that long peg was stuck inside the arm, and I had that ball-stump leftover. 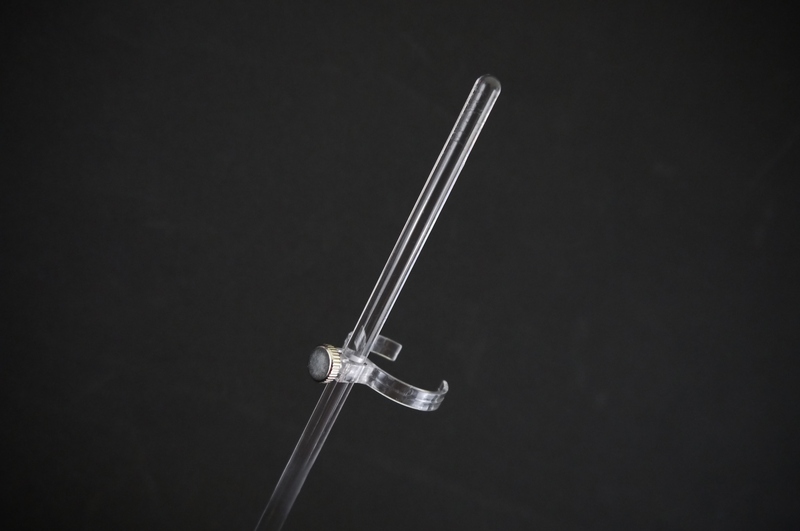 The actual hands themselves connect to the shorter, thicker pegs, and as a result of their design, the wrist pretty much has omnidirectional movement despite not being a ball joint. To remedy the issue, I went ahead and glued the broken ball-like area into the broken wrist, leaving the stubby peg exposed as the new hand-to-arm connection point, since the original long peg was lost inside the body. This essentially takes away the up-and-down movement offered by the ball section, but at least it means the left arm could still be interchangeable and the hands could still rotate on that stubby peg. She does come with a fair amount of manipulators, though note how the left hands all have the original pegs removed. And of course, the iconic flaming eyepiece is also included, with a whole new set of hair to boot. I’m actually extremely impressed with how the clear blue was done; it looks downright gorgeous. Medicom also goes out of its way to give us a painfully elaborate stand system, of which doesn’t even work well. 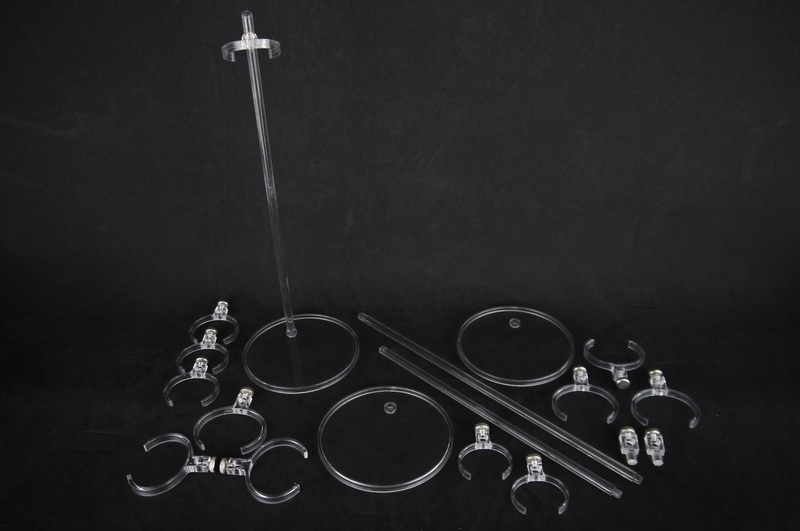 I’ll give them props for actually including three stands, as there are three circular bases and three clear poles (two long versions and one short) along with numerous clip pieces that don’t actually clip onto much. 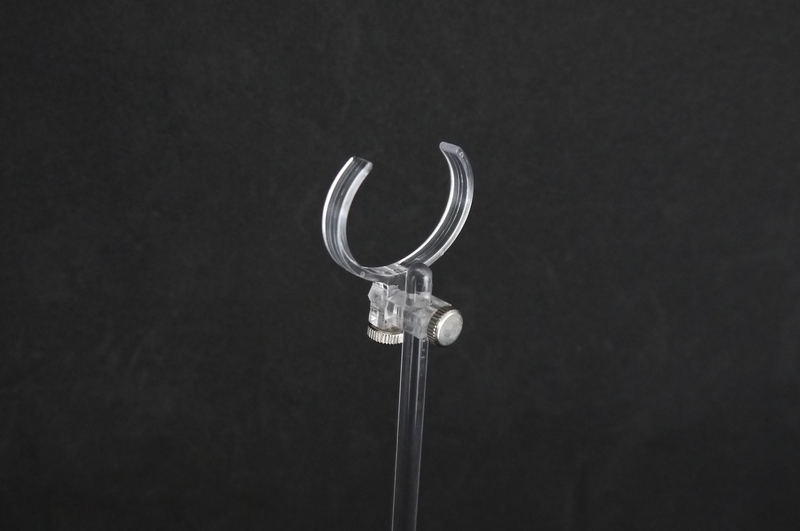 Instead of just including some nice articulated clip claws, Medicom decides to go the convoluted route and include like four different sized clips, with three copies of each, making for twelve total. It wasn’t impossible for them to just include three articulated claws, one for each stand. 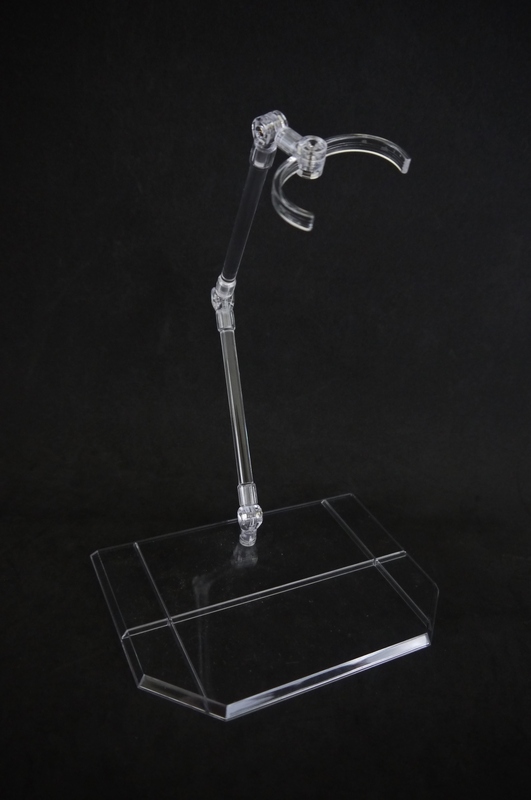 In addition, instead of making them adjustable on the stands or including a stand-to-claw joint, we get these funky clear adapters to put the claws up vertically, as shown above. 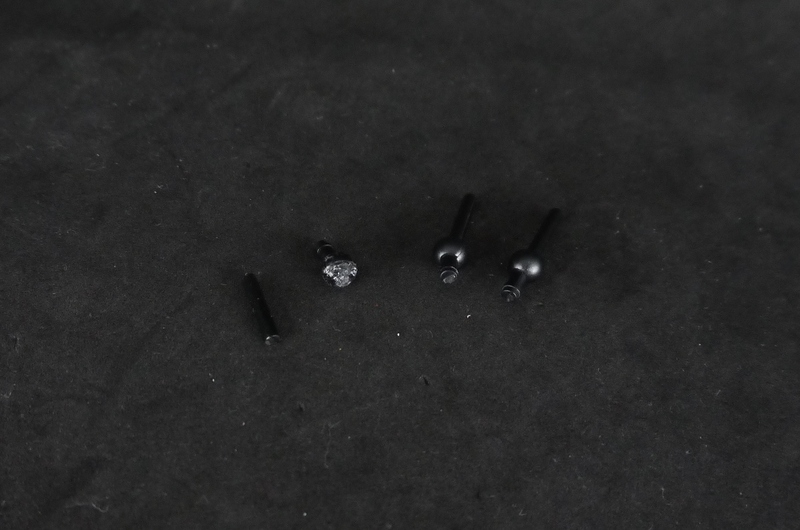 What’s more is that each bit is attached to each other via a screw-in system, where you turn those metal knobs to tighten a screw that basically drills into the plastic to hold things together. I would normally give them points for stability here, but the problem is the screws don’t actually hold well. More often than not, the screws don’t actually go in much, and the claws become loose on the stands, meaning they’ll slide down frequently. I’ll grant them that this stand design is pretty conservative and clean, but it certainly isn’t very effective. I should also mention that they include three because the Black Rock Cannon is big and heavy enough to warrant two stands on its own, and Black Rock Shooter is way too scrawny to wield that thing free-handed. 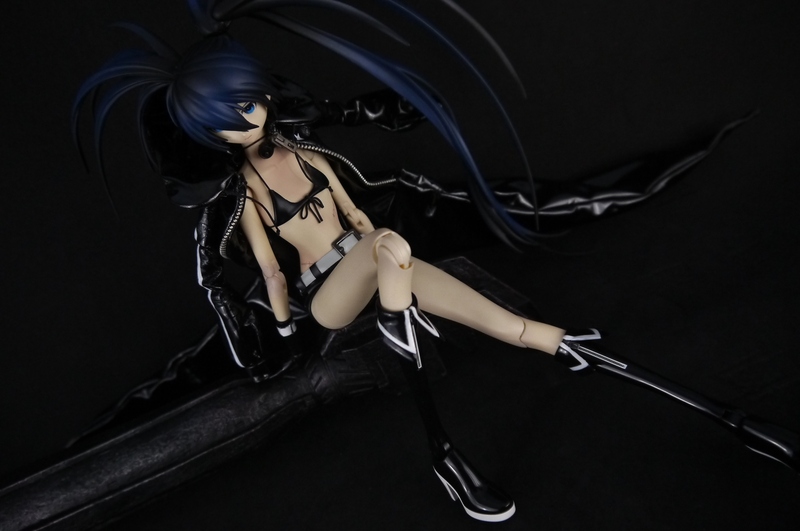 The claws don’t actually hold Black Rock Shooter up at all though – there’s literally almost no point I can find on her body to fit those claws around. Her abdomen/torso is so skinny that even the smallest clip slides up. I’ve seen some images of the largest clip around her hip, but when I tried it it simply slid along her curves and ended up under her arms. Plus that method seemed to potentially damage the shorts. I take consolation in the fact that Medicom at least learned from their mistakes and upped their stand game with their more recent release, Real Action Heroes Link (See: articulated claws! Adjustable poles! Stable design!). I ended up giving up on using Black Rock Shooter’s stand for her aerial poses here, and just used RAH Link’s stand instead. 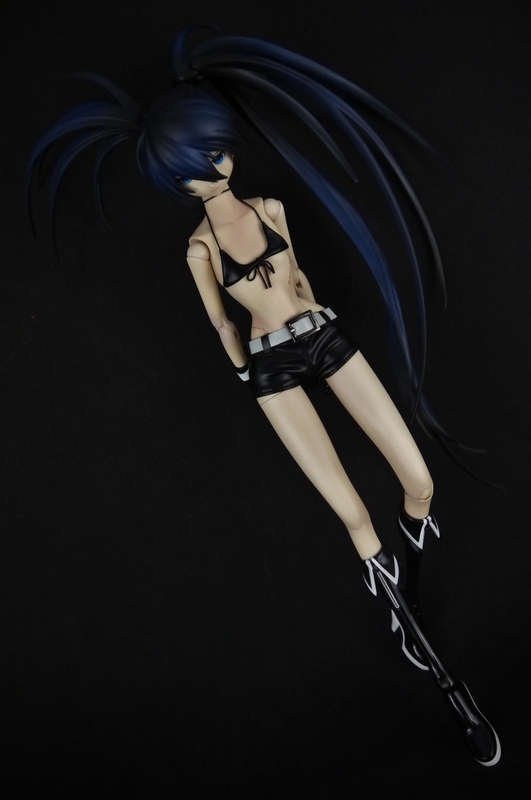 Black Rock Shooter’s weapon layout is fairly bare, but nothing to be scoffed at. That Black Rock Cannon is big and sturdy enough that I could probably bludgeon some poor unsuspecting soul to death from behind if I used it. 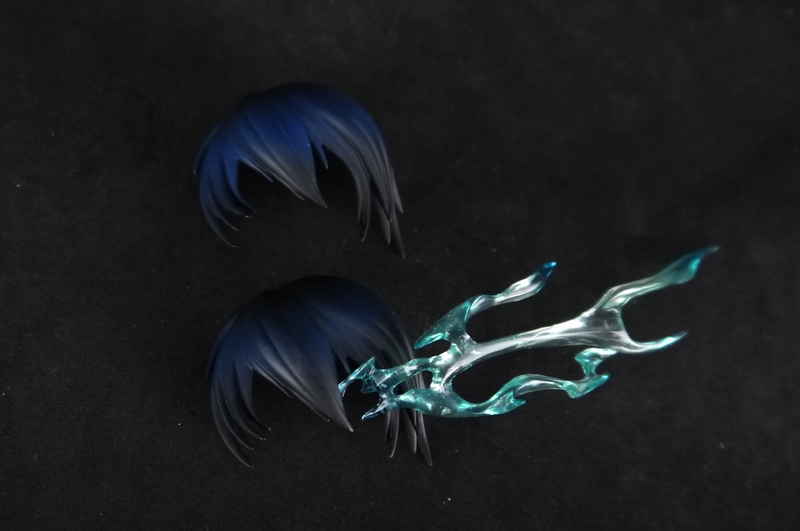 Starting with the Black Blade, Black Rock Shooter’s traditional katana. 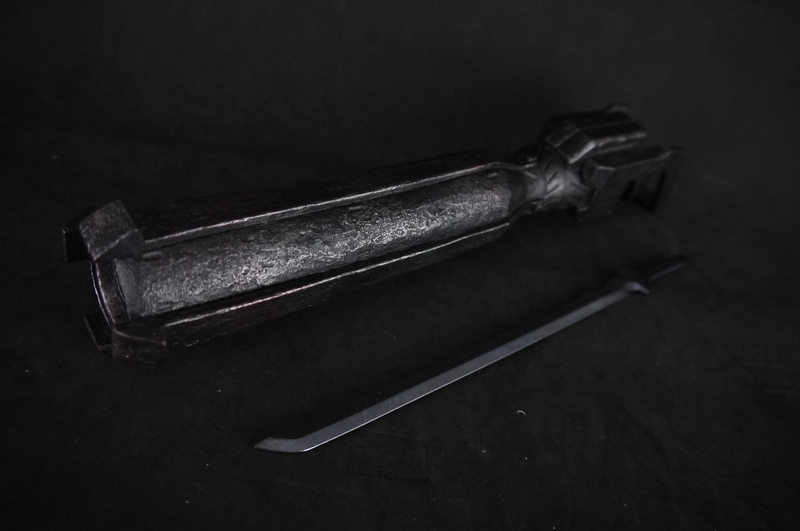 The sword isn’t anything too special, though it is pretty big given it’s in 1/6 scale. 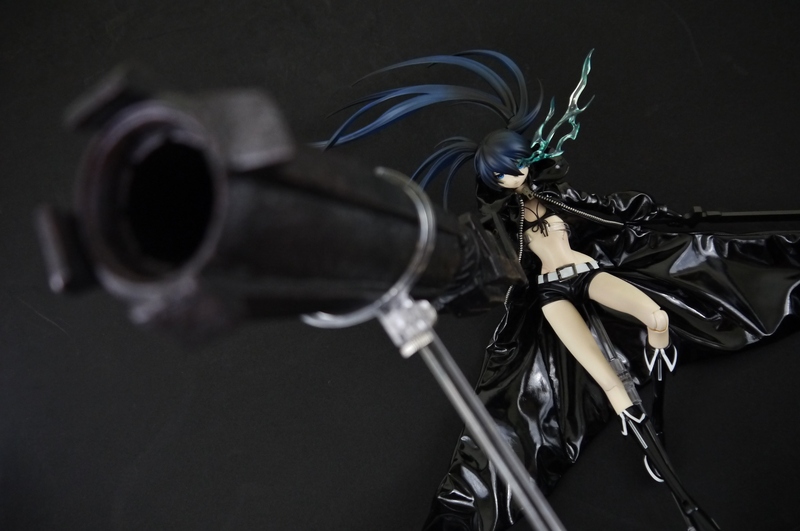 Black Rock Shooter doesn’t have any difficulty handling the weapon, and I feel like it’d be her usual default weapon given the Black Rock Cannon is insanely difficult to handle. 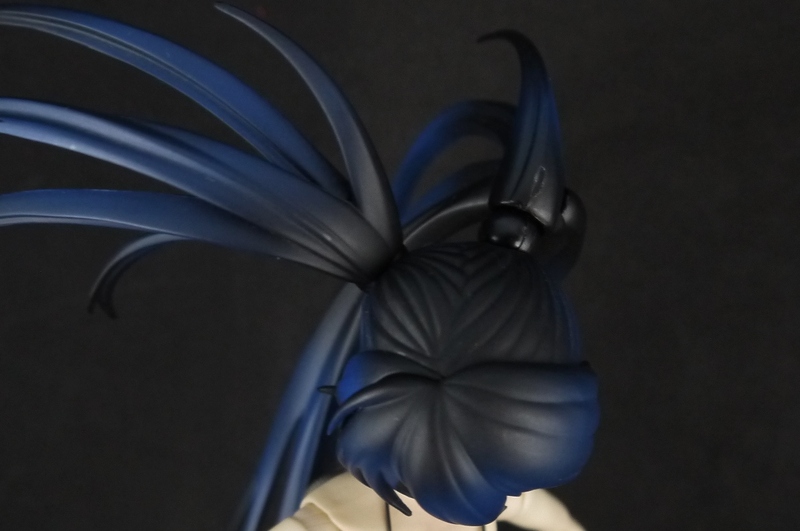 I’ll also mention here that the hair pieces are quite articulated – both tails attach into the head via a peg-and-hinge joint, allowing for pretty much omnidirectional movement, similar to the wrists. 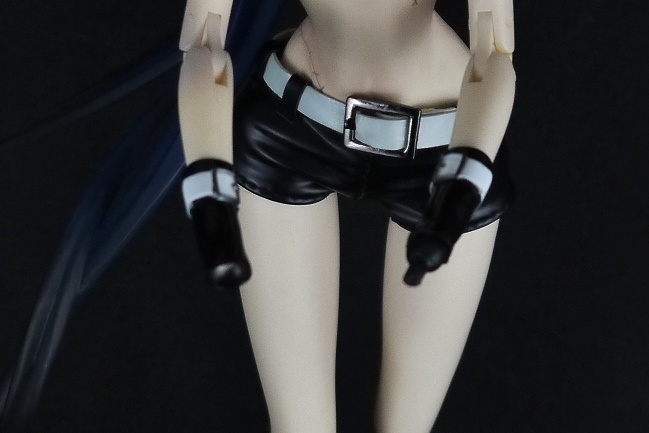 While the smaller right-side hair bit isn’t much of a problem at all, the giant mess on the left size can cause some weight balance issues – it actually ends up tilting Black Rock Shooter’s head sideways sometimes. Beyond that, the left side hair strands also have two sections that can move independently, allowing for even more hair-flowing posing possibilities. The tips and strands are extraordinarily delicate though – I’m honestly surprised I haven’t broken mine in any way. Finally bringing out the big guns…errr, gun. I’d just like to say that I still find it extremely improbable that a tiny girl like her would be able to swing around that behemoth like it’s a wooden stick. Like, she can barely stand on her own, what with her toothpick ankles and needle heels – she’s using the cannon as a support to hold herself up in this shot. I’m like 90% sure the cannon wasn’t actually this large in-series. Medicom blew it up bigtime, and decided to add some crazy granite-like texture to the whole thing. 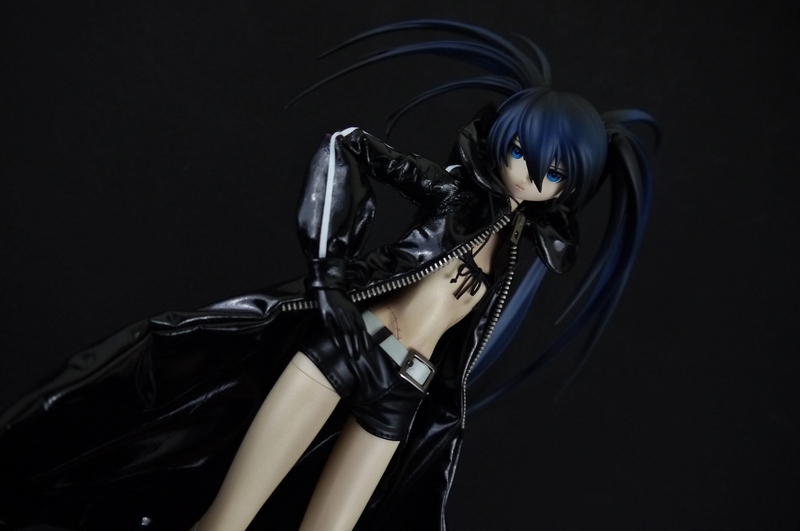 While i doesn’t look bad, it’s off-putting next to the perfectly smooth Black Rock Shooter and the rest of her accessories. Nothing on the cannon actually moves either – it’s literally just a giant massive hunk of plastic/rock/blackness/whateveritsmadeof. We actually also get a single left hand that’s specialized for holding the cannon. Technically this means that Black Rock Shooter can’t wield it right-handed, but you can just use one of her open-palms and stick it into the trigger area, no one’s going to see. Okay, as cool as the cannon-up poses look, honestly I don’t know what they were thinking when they made the bloody thing so massive. I can’t imagine anyone just having enough space lying around to show it off like this. Like, it’s one thing to buy a HGUC Dendronium, anticipate it being massive and needing to make space, but it’s another when you thought you were buying a scrawny cannon-flailing badass chick and end up clearing a whole table just for her. 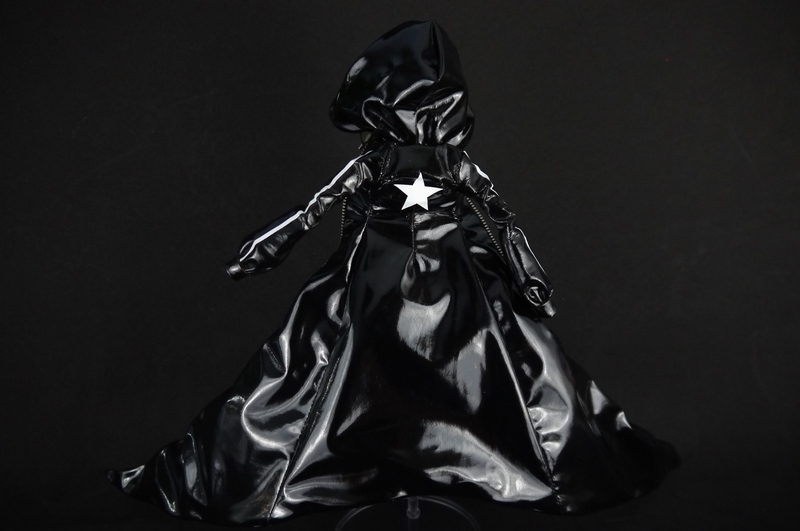 The thing’s literally taller than Black Rock Shooter herself and probably three times as heavy. It’s definitely not hollow inside; Medicom didn’t cut any corners here. I’m pretty sure Medicom recommends using two stands for the cannon and one for BRS herself, but one is really enough. 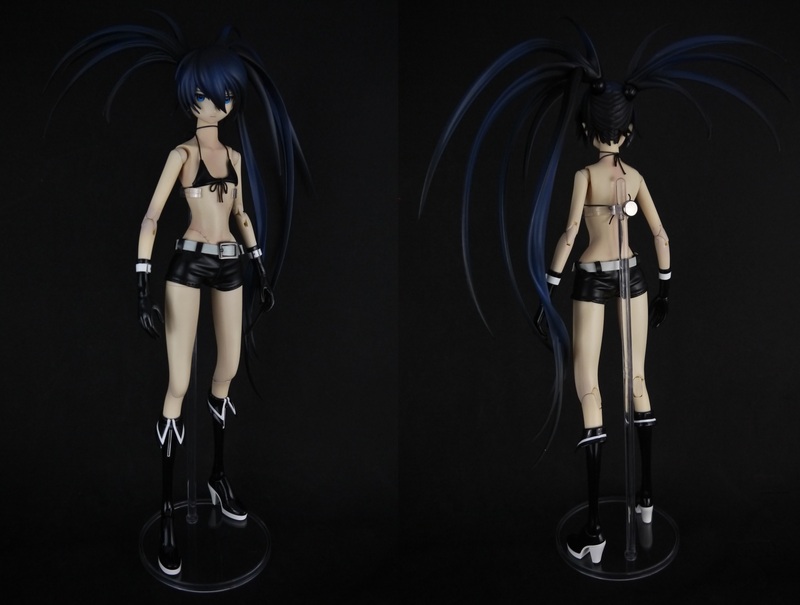 I kind of glossed over this earlier, but I should point out now that Black Rock Shooter can’t really stand on her own under normal circumstances…which I suppose contributes to the overabundance of display bases that Medicom includes here. Her absolutely tiny and skinny legs don’t really support her heavy head and hair locks, so actually finding a way for her to stand on her own without tipping over is a miracle to behold. 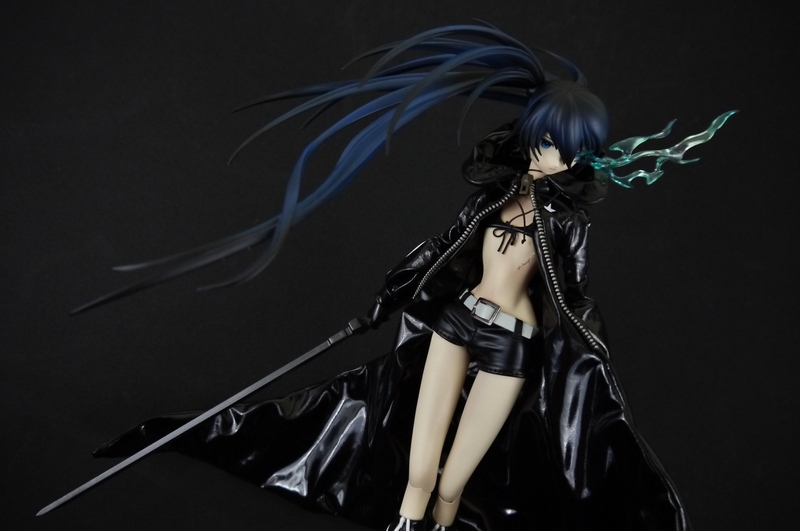 While I’ve ultimately decided to sell this beauty off because I’ve been strapped for cash lately, I gotta say this has still got to be the best BRS figure out there. Granted, it’s obviously not for everyone given the painful debt-inducing price tag, but all things considered I think it’s worth it. I really have to tip my hat at Medicom’s efforts with the face sculpt most of all – I’m loving how sharp and defined it looks, compared to the more Kyoto-animation-esque roundness of the Figmas.